As a twenty-two year old who struggles with acne-prone skin, I always love trying new exfoliators to cleanse my skin. I can't stress enough the importance of having a solid skincare routine. Flawless makeup application starts with skincare. 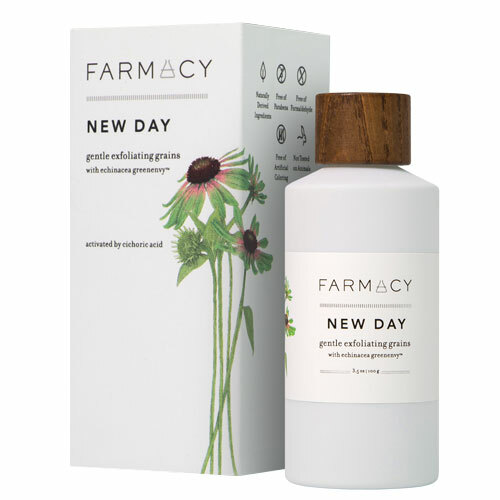 Today I am reviewing the Farmacy New Day Gentle Exfoliating Grains (with echinacea greenenvy). Farmacy is a new skincare brand that recently launched at Sephora, QVC and online at farmacybeauty.com. This gentle exfoliator contains; natural cranberry seeds, rice bran powder, white willow bark, carrot, green tea and marshmallow soothe. All these ingredients work together to deep clean, exfoliate, brighten, clarify and helps absorb excess oils and surface impurities. To use these gentle exfoliating grains, you pour out your desired amount (about a quarter size) and add a small amount of water to create a foaming exfoliating cream. Once the cream texture is achieved you can apply it to your face in a circular motion, just as you would if you were using a cleanser. For more on the Farmacy brand, check out this video! After using this product for a little over a month, I can see how much it has brightened my skin. I have never used a cleanser that leaves my face feeling extremely soft and rejuvenated after using it. Even on nights where sleep has taken over and I have fallen asleep with makeup on, this product saves my skin from breakouts and renews my dead skin cells and makes my skin feel as if I never fell asleep with makeup on. I love using this product 4-5 times per week and I definitely notice the difference in my makeup application. My makeup goes on a lot smoother and I have been getting more compliments than usual on how radiant my skin looks. These gentle exfoliating grains are golden and I can't wait to try out more of the Farmacy Beauty products.